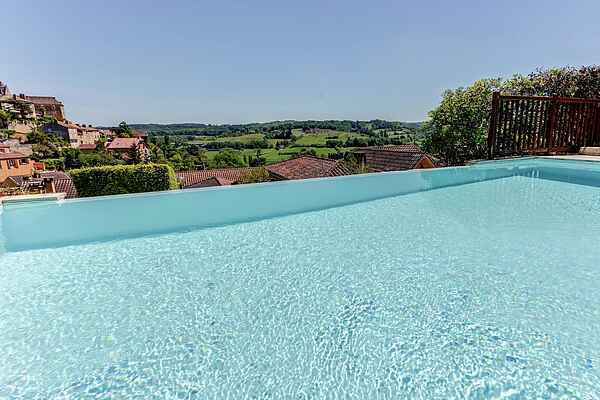 From your infinity pool you will have a great view of the beautiful Belvès. Such a unique location of this comfortable linked holiday home. The road leads to stairs up to your front door and on to the first terrace. The fenced-off garden contains four levels. There's a sandbox for the kids to play and you will find English books to read. You can comfortably leave your car in the private garage. This house is in the centre of Belvès. The more than 500 years old covered marketplace is the historic centre. There is so much happening here, both below and above ground. Underneath the marketplace you'll find underground dungeons that most likely served as cave dwellings. Above ground you can enjoy a walk through the city, along the beautiful houses and of course the cozy terraces. Canoe or sunbathe on the beach near Siorac-en-Périgord (7 km). A bit further away you will find Sarlat-la-Canéda, the \"pearl of the Périgord\" (35 km). It's a lovely town to stroll through. You can find prehistoric remains in and around Les Eyzies-de-Tayac-Sureuil (24 km).